Currently, Data & Images are available from June 19, 2002 to present. Data and Images have been back indexed through June 1, 2007. The earliest document image available online is 535447, Dated June 19, 2002. Any Documents prior to that data are only available for searching in our office. In Livingston County, as in the majority of counties in Illinois, the County Clerk also serves as the County Recorder. 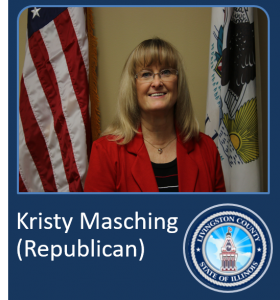 The office is currently held by Kristy Masching, who was elected in November of 2004. She is assisted by five full-time deputies in the Historic Courthouse office and two full-time deputies in the Bookkeeping Department also located in the Historic Courthouse. The County Clerk has a variety of duties. Some areas are very familiar to the public, such as elections and vital records. In the vital records division, the Clerk’s Office issues marriage licenses, including at the correctional center located in the county, and is responsible for maintaining all birth, death and marriage records that occur in the county. Marriage records go back to 1837, births to 1856 and deaths to 1878. In 1916 a state law was passed requiring that records of all births and deaths be filed with the county and establishing a state office where the records are also to be filed. Prior to that, since many births and deaths occurred at home, the records were often maintained only in family Bibles or church records and are unavailable in the Clerk’s Office. For the protection of the public, state law is very restrictive as to who may obtain copies of vital records and what records are available for viewing by genealogical searchers. The election division has jurisdiction over 52 precincts and is responsible for approximately 22,000 registered voters. The entire election process is administered by the County Clerk, from voter registration to completion of an election and verifying results to the state. Schools for election judges are held every two years and are conducted by the Clerk’s office, with occasional non-mandatory refresher courses held in between. In even numbered years, there are two elections: a primary in March and a general election in November. Starting in 1999, in odd numbered years, there is a consolidated general election in April and, if necessary, a primary is held in February. The primary applies only to the Cities of Pontiac and Streator, where candidates for the April ballot are chosen by election rather than caucus. The County Clerk works closely with the County Assessor and the Treasurer in the real estate tax process, receiving budgets and levies from approximately 125 taxing bodies in the county, entering data that goes into the calculation of the tax bills, verifying annexations, updating drainage districts, and reporting to the state. The Clerk also attends the annual tax sale, collects all delinquent and forfeited taxes, and is responsible for reimbursing the tax buyers and reporting their percentage income to the Internal Revenue Service. Responsibilities of the office not as well known to the public include processing raffle and liquor license applications, and maintaining records of small businesses (assumed names), notaries public and statements of economic interest. In addition, the Clerk maintains all records of the County Board and prepares the official proceedings of County Board meetings. The Clerk also swears in new deputies for county offices. The Bookkeeping Department is responsible for accounts payable and personnel records for most county departments, and payroll for approximately 350 employees as well as judges of elections and County Board members. The Recorder is responsible for maintaining the land records of 24,631 parcels of land in Livingston County. This includes deeds, mortgages, liens, assignments, releases, and plats, as well as corporations, since 1837. Land records are maintained by tracking indexes and grantor/grantee indexes and, pursuant to state requirements, by microfilming. Veterans’ discharges are recorded in the office and copies provided upon request, with no recording or copy fees charged to the veteran. Veterans’ records are available from 1862 to the present.